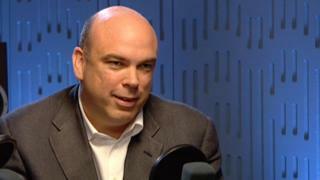 Mike Lynch, the former chief executive of software giant Autonomy, has been charged with fraud in the US. The charge, which carries a maximum term of 20 years, relates to its 2011 sale to computer giant Hewlett-Packard. Prosecutors targeted Mr Lynch after his former finance chief, Sushovan Hussain, was found guilty of accounting fraud. Autonomy was seen as a runaway British success at the time of its $10.3bn sale to HP. Mr Lynch’s lawyers say he will “vigorously defend the charges”. The court documents say Mr Lynch made $815m from the fourteen charges levelled at him. Before it was bought by Hewlett-Packard, Autonomy was a UK company with headquarters in San Francisco and Cambridge. In 2010, about 68% of Autonomy’s reported revenues came from the US and elsewhere in the Americas. According to the charges, between 2009 and 2011, Mr Lynch and Stephen Chamberlain, vice president of finance, along with other co-conspirators, artificially inflated Autonomy’s revenues by overstating them. The two are also accused of making misleading statements to regulators and market analysts covering the company. The charge sheet also says they “intimidated, pressured and paid off persons who raised complaints about or openly criticized Autonomy’s financial practices and performance”. Mike Lynch’s lawyers, Chris Morvillo of Clifford Chance and Reid Weingarten of Steptoe & Johnson, said in a statement the indictment was “a travesty of justice”. It went on to say Mike Lynch was a “world-leading entrepreneur who started from nothing” was being made a scapegoat for HP’s failures. It called the allegations “stale” and said they amounted to a business dispute over the application of UK accounting standards, something which is the subject of a civil case with HP in the English courts.